TV viewers are idling away the final weeks of summer the way they started it: with reality programs. Half of last week’s 20 most-watched programs were unscripted contests, according to Nielsen Co. figures released Wednesday. The field was topped by NBC’s two episodes of “America’s Got Talent” and the Notre Dame-Michigan football game, helping make the network the most-watched for the ninth consecutive week. 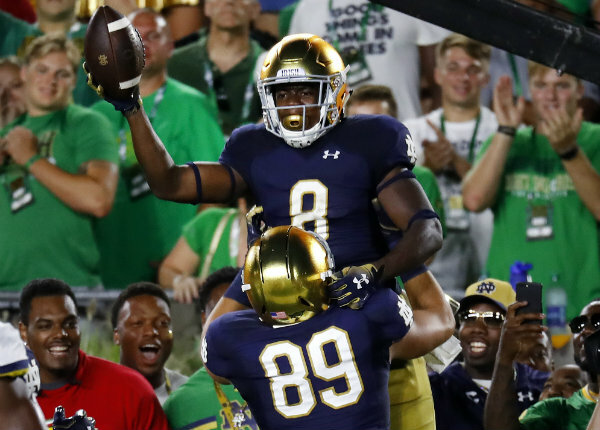 Notre Dame’s prime-time 24-17 victory drew the team’s biggest audience on NBC in 13 years, since a game against University of Southern California in 2005. Amid a somber week of tributes to the late Sen. John McCain, a rerun of “Saturday Night Live” provided a reminder of the politician’s trademark humor. The episode featuring him as host gave the show its biggest audience in six weeks, NBC said. ABC’s “World News Tonight” topped the evening newscasts with an average of 8.2 million viewers. The “NBC Nightly News” had 8.1 million and the “CBS Evening News” had 5.8 million. Below are primetime viewership numbers compiled by Nielsen for Aug. 20-26. Listings include the week’s ranking and viewership.